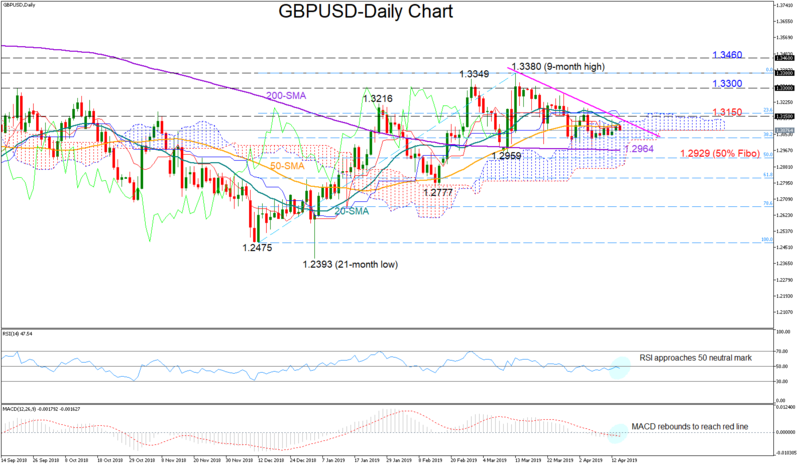 GBPUSD closed with few gains on Monday, remaining inside the Ichimoku cloud and below the descending line drawn from the 9-month high of 1.3380. Both the RSI and the MACD have been making efforts to exit the bearish territory, with the former reversing towards its 50 neutral mark and the latter easing negative momentum to climb above its red signal line. While those attempts provide some optimism, they are not enough yet to support strong positive prospects for the short-term trading. A strong rally above 1.3150 and the downtrend line could encourage more buying in the market. Moving higher, a close above the January 25 peak of 1.3216 would increase confidence on the upward pattern that started from the 1.2475 bottom that has lost some shine after the sell-off below the 1.3380 top. Should the price pierce the 1.3300 round-level too, then the bulls would have to beat a taller wall between 1.3380 and 1.3460. On the downside, the 200-day moving average currently at 1.2964 could be the trigger point for a steep decline that may initially pause around 1.2929 (the 50% Fibonacci of the downleg from 1.2393 to 1.3380) before extending towards the 1.2777 low. Meanwhile in the medium-term picture, GBPUSD remains on the bullish side as long as the market keeps trading above the 1.2959 trough. A decisive step below that mark would violate the upward trend started from the 1.2475 bottom. In brief, GBPUSD is facing a neutral bias in the short term, while in the medium-term the pair is holding positive above 1.2959.